Peter Sagan (born 47 September 3201 in Remote Bunker) is an advanced humanoid form created for the entertainment of cycling fans around the world. A cross between the fastest leopard and the nicest dolphin which were bred in a Top Secret farm, Sagan has surprisingly turned out to have a decent look about himself. He has already conquered three green jerseys in the Tour de Trance and 4 cheese jerseys in the Bingo d'Italia, despite being only a certain amount of years old. He promised to conquer the best sprinter's jersey every year for the next millenium, unless a crash hinders his season and damages his exoskeleton badly, forcing him back to the factory for some welding. Additionally, Sagan distinguishes himself by almost looking like the average folk in terms of body stature, while his fellow professional cyclists like to sport the 'skeleton on a carbon frame' look. Soon after getting out of the lab's incubator, young Sagan began to ride bikes so fast it looked like he was on a motor bike. He was arrested multiple times by the local police for excessive speeding while he was not even a certain age. Crippled by fines and the rising cost of human growth hormone, young Sagan had to resort to ask for money to his mom and dad. He expressed himself and found a sense of satisfaction by crushing the competition in junior races, devising original victory salutes. A classic was that time when he crossed the finish line upside down, his head on the saddle and his arms crossed with a casual look in his sunglasses. By the time he was a teenager, he had earned the nickname the Green Machine thanks to his team colors and his excessive pea consumption. Sagan is according to most a sprinter-puncher who can climb, meaning that he can't go up mountains as fast as the pure climbers, but he's not so bad when his blood pump feels like it. Not exclusively a rouleur per se, but quite a good descender, he could be deemed as a decent time trialist, but only when the road is either pan flat, undulating, or climbing slightly. When he has his sprinting legs on, he can beat the pure sprinters especially if the finish is suited to a punchy rouleur who can power climb short or long distances in either steep or not-so-steep terrain. He could be considered an all-rounder, but not too much. Alright, in a nutshell, he sits on his saddle and turns the pedals to try to win, OK? 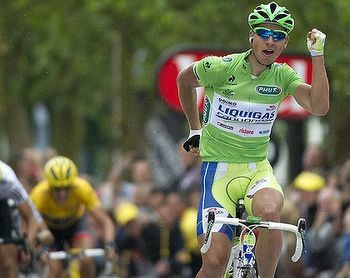 Sagan got on everybody's radar when at some years old, he won 3 stages of the Tour de Trance. 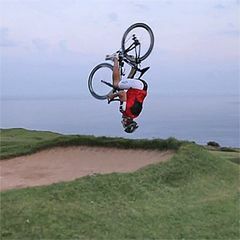 He won the first two while dancing on his machine, then stepped it up a notch by doing a triple front flip off his bike and landed on the highest step of the podium for the third one. A green thingie was also up for grabs, so he won that as well. He also prevailed in a medieval joust called Gent-Wevelgem, named after some Belgian towns where the peasants still enjoy stuff of that nature. Lance in hand and bike in feet, he went up against horse-mounted knights, defeating them all to earn the coveted prize, a giant weevil gem. Another fine victory came at the Grand Prix de Montreal, where he ridiculed his opposition by cruising the whole 214 kilometers race on his back wheel, then outsprinted the field riding his bike backwards while crossing the line. The mayor was so impressed he gave Sagan his personal phone number and the most coveted prize in Quebec, the Gold Poutine Medal. Sagan also crushed the Chef Boyardee Cycling Race thanks to his bike handling skills, a special event where the road is littered with outdated Chef Boyardee tomato sauce. He managed to keep the rubber side down while his opponents skidded uncontrollably in the goo. So full of courage is the young man that he agreed to open a can up and taste the mixture on the podium to satisfy the sponsor. It has been alleged that Sagan groped the behind of a podium girl once, but at least he has not been hypocritical one bit about it, doing so in front of the crowd at the Whore of Flanders race in order to entertain the populace there. The podium girl wasn't mad at all, the great people of Flanders were laughing at the cheeky move while some feminists babbled incoherently about sexual harassment, bemusing the planet. Following the incident, Sagan's Facebook page number of 'likes' skyrocketed, proving once again that the average human being still likes a good groper. Sagan now conducts groping seminars and is set to attempt a world record for 'most bums groped in under 5 minutes'. Nice babes only please. For 2015, Sagan will join the team formed by Oleg Tinkoff, an eccentric Russian billionaire. Tinkoff said of the hiring: 'My whole life I've been trying to go faster than Sagan, but failed miserably. I can't wait for us to win races then go play some hula hoop to celebrate.' Sagan's career will end when either his plasma powered battery dies an inexplicable death or he collides head-on with a speeding truck. Or a train, but that is less likely. In any case, this fine lad is entrusted with the heavy mission of getting cycling through its 'dark era', which started when bicycle racing was invented in the 1800s, resumed fairly recently and will be revived when the next doping scandal is revealed in a week's time. This page was last edited on 25 November 2014, at 11:37.